Hotels in Morocco! Are you looking for Hotels in Morocco? Rusticae exclusively selected the best boutique hotels in Morocco at the best prices. Visit hotels, rural country houses, accomodations or apartments. Enjoy our exclusive offers of Rusticae Hotels in this beautiful country. Morocco is a close exotic destination, although it remains a great unknown. It is located in North Africa right by the Mediterranean Sea and the Atlantic Ocean. Morocco is perfect to get into Arab and Berber culture, to visit the medinas, to travel through the Sahara on camels, to admire the architecture of mosques and madrasas, to trek through the Atlas Mountains, to taste local food like tasty tajine or couscous, Get lost in its souqs (marketplaces) or relax in its riads and hammams. One of the best ways to get to know the Moroccan culture and traditions is to visit the Imperial Cities, such as Fez, Rabat, Casa Blanca or Marrakech. 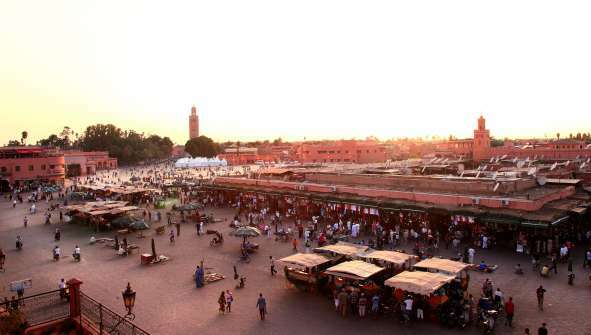 The Red City, as it is known as Marrakech, is a must. The heart is its Medina or old city, declared a World Heritage Site by UNESCO in 1985. Here you have to visit the Djemaa el-Fna Square, the Koutoubia Mosque, the Ali ibn Yusuf Madrasa, the ruins of the El-Badi Palace , the Royal Palace and, above all, the Saadian Tombs. The city of Essaouira, facing the Atlantic ocean, and the city of Tangier in the north, overlooking the Mediterranean, are very interesting destinations. Tangier is the gateway to the European continent and it fascinates everyone who visits it, for its bustling port, its chaotic streetlife and its rich cultural diversity. A place that was a refuge and inspiration to artists like Paul Bowles, Henri Matisse or Juan Goytisolo. The most charming area is the Medina, formed by medieval streets where you can find the Plaza del Zoco Chico, the markets, the Great Mosque and the Kasbah.